Millie’s Heating & Air Conditioning provides air conditioning installation services in Arlington, VA and the surrounding areas. We install quality brands, such as Amana and Carrier, and we can help you save energy with a new high–efficiency heat pump or zone control system. For customers who are concerned about the air quality inside their homes, we are qualified to install whole–home air filtration systems in your current HVAC system to improve indoor air quality. We’ll also help you maintain more accurate temperatures with a new digital or programmable thermostat that has a variety of energy–saving features. The next time you need an air conditioner installed, call Millie’s HVAC. Because heat pumps can provide both heating and air conditioning, having one installed by a qualified professional is essential in making sure it is installed correctly. Whether you need a new heat pump installation or you want to replace an older one, we install quality heat pumps made by brands we trust. If you are interested in a ductless mini split heat pump system, it can also heat your home in the winter by adding electric heat strips. If you are ready to upgrade to a high–efficiency model, call the heat pump experts at Millie’s HVAC. Regardless of the style you choose, we’ll make sure that you continue to get reliable AC throughout the cooling season with a brand new heat pump system. Proper AC installation and sizing is important for several reasons. If you’re having a central air conditioner installed, the contractor will need to understand the proper placement, design, and size of the ductwork. The actual central AC unit will also need to be the appropriate size for the home in order to cool your home more efficiently and effectively. If all of this is done correctly and routine maintenance is performed, you are more likely to have many years of reliable air conditioning from your system. Provide access to the indoor coils for easy maintenance and cleaning. Size ducts in new systems with methods based on industry best practices. Install new ductwork in areas that are insulated (when possible). Install an adequate amount of supply and return registers to cool home effectively. Seal all ducts for new and existing ductwork and central AC systems. Install condensing unit in an area where trees or bushes won’t obstruct airflow. Check factory–charged refrigerant levels, or charge unit in field with correct amounts. Install all thermostats in places where natural heat sources won’t affect accuracy. If you want quality AC installation in Arlington, VA by HVAC contractors you can trust, call the experts at Millie’s Heating & Air Conditioning. We install top of the line brand names, and our technicians are qualified to install your new air conditioning system according to industry standards and best practices. 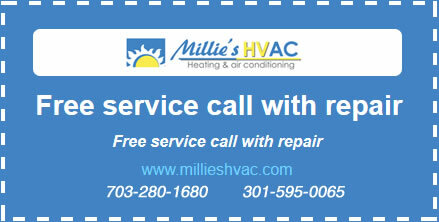 Call Millie’s HVAC today!